Note: Forgive the lateness of this review. It was supposed to go up yesterday, but I spent this weekend organizing and running my daughters 5th birthday party. This yo-yo takes me back to Cal States 2010. That March 6th during the 1a prelims, Jensen took the stage without his signature CLYW shirt and carrying three ProtoStars by YoYoFactory. When I announce sponsored players, I always try to say who they are representing. When I saw Jensen with a blank white t-shirt and ProtoStars, I asked him. “Jensen, are you repping YYF or CLYW?” His reply was “YYF” which reeled both myself and the contest crowd and then went on to win the state level contest. He then won Regionals, several national contests, and the World Yo-Yo Contest. It was during that flawless competition run that Jensen decided he loved the ProtoStar, but wanted it a bit heavier to match his play style. This brought us the NorthStar, and a whole community eager to give it a spin. I had seen pictures of the NorthStar prior to trying out the sample model YoYoFactory sent me. ProtoStar body, YYF display box, center trac bearing; Honestly there is not much difference than the ProtoStar except for what looks like bigger weight rims and a killer color combo. I like the translucent body of the ProtoStar but the cream white body with red rings that are on the NorthStar looks amazing. I love the graphic on the cup cap. 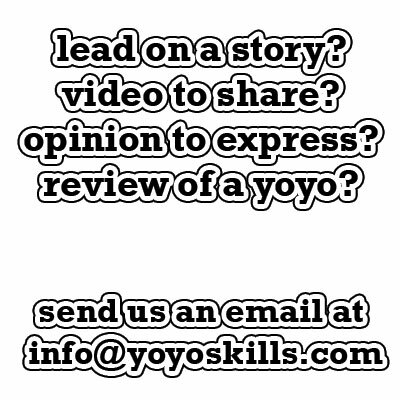 It is very clean and concise, and matches the personality of the yoyo. It has a nice look, and remembering how much a different feel the Starlite had because of the reduced weight, I can’t wait to see how an extra 2 grams makes the NorthStar feel. The NorthStar, shape and tech wise, is essentially a ProtoStar with heavier weight rings and a different cap. Much like my recent review of the Starlite, I am going to be pulling this section from the ProtoStar review. Since the ProtoStar and the NorthStar have the same body diameter, width, and shape, there is really no difference when it comes to comfort and tech. There is no doubt, that the ProtoStar is a full size yo-yo. At almost 56mm in diameter, the ProtoStar fills even the largest hands. I don’t have a first generation ProtoStar to compare it to, but it seems now that the yo-yo fits better in my hand. When you break it down to the brass tacks, the ProtoStar is a plastic body yoyo with weighted inserts. The spacer system has changed since the first one I looked at. It looks like the new spacer setup brings in the gap and also sits tighter in the spacer well. The 4.55mm gap is just the right size for the Center Trac bearing. The Center Trac bearing works very well in this setup. 4.55mm is not a small gap, but it is not huge either. The Center Trac bearing keeps the string off the CBC pad response, but should still provide a stable response when bound. The pad response is replaceable, but I am not sure about siliconing the groove. It looks deep enough, but don’t quote me on it. Regardless, the CBC Pads will last a long time, are not that hard to find, and don’t cost an arm and a leg to replace. The catch area is very open and provides a comfortable hold. It hits the thumb meat perfectly. The rounded edges don’t dig into your palm and the dang thing is just comfort city. 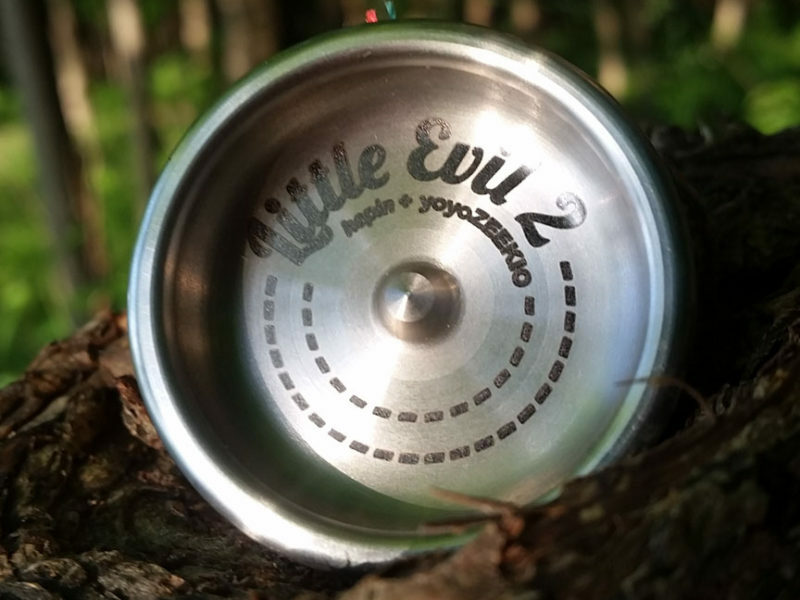 42mm width is just perfect for a yo-yo with this diameter. The metal weight rings are really the only thing that has changed here. I don’t mean to minimize what YoYoFactory has done here, intact I applaud it. Weight seems to be the biggest factor people look at when picking out a yo-yo. Now with the Starlite, ProtoStar and NorthStar, we have a shape that falls over the entire upper 60 gram spectrum. No matter what your weight preference, there is a good chance there is a ****Star that will fit your weight preferences. Like all new YoYoFactory plastics, the NorthStar has arrows to keep you yo-yo tuned and acts as a guide to keep you from overnighting the halves. The extra two grams in the NorthStar really takes this yo-yo from a ProtoStar clone and makes it its own entity. It has a completely different feel to it. While the yo-yo feels exactly the same in your hand as the ProtoStar, the extra weight moves the NorthStar at a smoother steadier pace. It does not move as fast as the ProtoStar but it is not what I consider a slow play. The extra weight gives the NorthStar a very stable and steady feel. Since it shares the same shape as the popular ProtoStar, it is pretty obvious that where the ProtoStar excelled at, the NorthStar would follow. The NorthStar catch zone is very clean and open. Transitions were a breeze, and even the messiest of hops were met with a vibration and wobble free spin. I would say that the NorthStar seemed to handle sloppy play better than the ProtoStar thanks to the increased weight and stability. Like the rest of the star line. the diameter falls in at 55.8 mm, but I had no problem putting the NorthStar though the paces of chops and string segment transfers. Grinds were pretty much the same also. The plastic is not treated with the intent to work well in grinds, but a careful aim will give you an accurate and steady climb. IRG’s were very rough, but I don’t think that they had IRG’s in mind. There was not enough room for me to get my thumb under the weight ring. Jensen’s play style is very smooth and relaxed, and that looks like exactly what the NorthStar was created for. What the NorthStar does share with the ProtoStar is playability. The hand winning shape and construction makes the NorthStar a great performance piece at a bargain price point. The extra two grams in the weight rings gives the NorthStar a completely different feel than the lighter StarLite and ProtoStar. It feels smoother and steadier than the ProtoStar which, considering how much I liked the ProtoStar, really says something. There have been a few reports regarding cracking on some of the earlier runs, but from what I have heard, YoYoFactory seems to have worked that out. 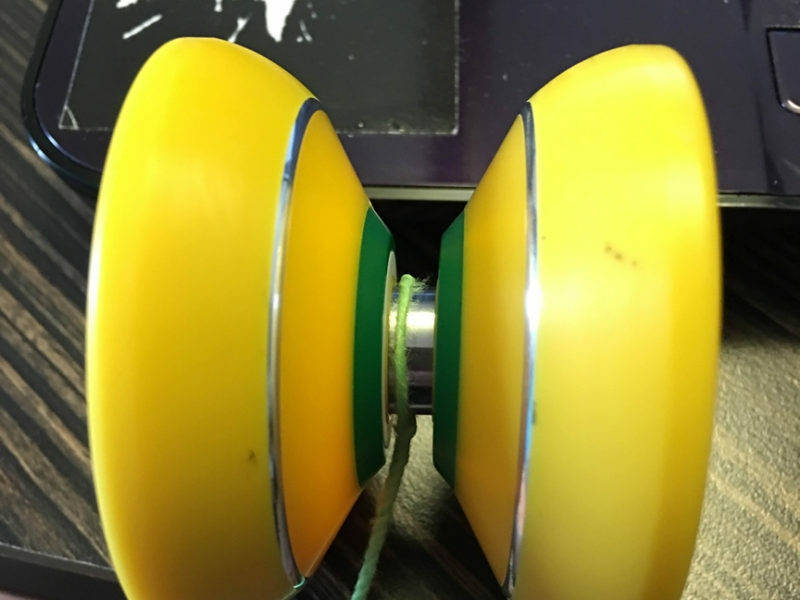 If you have a cracked NorthStar I encourage you to contact YoYoFactory directly. Bottom line: If you like the ProtoStar shape, but wished the yo-yo was a tad bit heavier and played a bit slower, then the NorthStar is a good choice for you. At a bargain price of $35 your not risking much for a great throw that will outperform many of the metals in your collection. 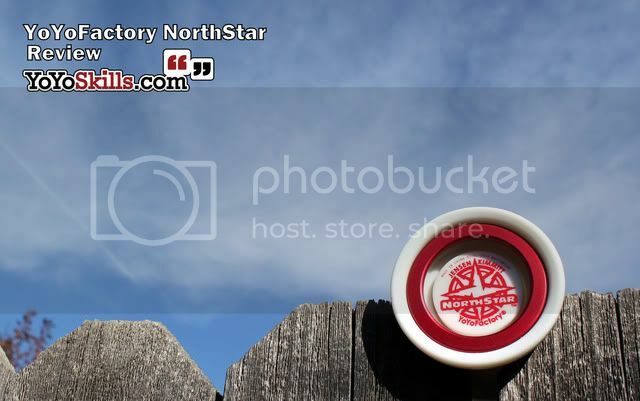 The NorthStar is a great addition to both the YoYoFactory Star line and your collection box. Everywhere. The NorthStar should be available for purchase from most of the stores listed on the right hand side of this page for apx $35. Written by Chris “Dr. Yo-Yo” Allen who wonders if YoYoFactory is going to make a mini ProtoStar and call it the Childstar…..
Actually the arrows are there so that when they are aligned the yoyo has the least vibe possible. Don’t align the and you will be amazed by the vibe! The metal weight rings are really the only thing that has changed here. Written by Chris “Dr. Yo-Yo” Allen who is wonders if YoYoFactory is going to make a mini ProtoStar and call it the Childstar…..
Not sure how it is considered cost cutting to test every yo-yo? This ‘time’ when yo-yos did not have arrows and they played smooth, was that before or after buzzon? I find myself wishing there was a “Fist” in there somewhere. the arrows are there to keep you from over tightening and stripping the plastic slot where the axle nut sits. There was a time when yoyos did not have arrows. Some of them were inexpensive yet still played smooth. But now it seems all of YYF’s cheaper throws use this new technology. I wish someone would talk about it. I’m guessing (and it’s only a guess) that it’s a production cost-cutting device–compensating for sloppier tolerances in the construction of the halves with a spin-balancing machine on the assembly line, which finds a position where the wobble does not exceed tolerances and then slaps on the marks. What was your experience like? Was it easy to re-align the arrows after disassembly? Did it stay smooth? About the shape, on Jensen’s test vid on YouTube, he commented that the main differences are the weight and there is a new rim design. Just sayin and no offesnse. Just my finding and the basis of my first conment. @Phil: Yes, the new PGM and Velocity have a kind of rough blast finish that helps with grinds. do the new pgm colors have a bead blasted finish? So the line of stars should be referred to as *Star(pronounced star or starstar)? I like that nomenclature. Let’s hope for a small *Star that we can all love. I compared the two side by side and did not see a difference one bit. They look the same to me. You may be right about the different plastic on the orange ones, but unless they give it a beaded finish like the new grind machine, it still won’t be great for arm grinds. But, grinds do not make a yoyo. This is a great yoyo in many many areas. There is actually a difference in the over all shape. The rims aren’t as wide or flat as the Protostar and the gap is a little more narrow due to the rim shape. Also I heard that the orange colorway has some type of finish or is a slightly different polycarb so grinds are a bit easier. Great review anyways. It really helped me decide on a new throw. Just to throw it out there. the weight rings in the northstar have a bevel cut into them, making the weight ring itself lighter. the yoyo gained a ton of center weight though which is what gives it that crazy stability. also, some of the orange ones do have a different finish. it could have been how the mold was surfaced or it may have been done after but i’m sitting here with my orange one from worlds and my white one that i just got and there is a clear difference in finish. however, the orange ones that we got in with this last order are finished the same as the white ones. Very awesome! I have always wondered if 2 grams meant anything, but I DO have a very creeping suspicion what there will be a undersized “Star” in the works at some point.